Hello all! Sorry for the short, unexpected break. I'm back now. Shew. Speaking of short and breaks...you'll see I'm sporting a new, shorter look in the nail department. It's kind of refreshing to "reboot" my mani every once in awhile, even if it's initially under duress! So I have a new-to-me brand to introduce to you. 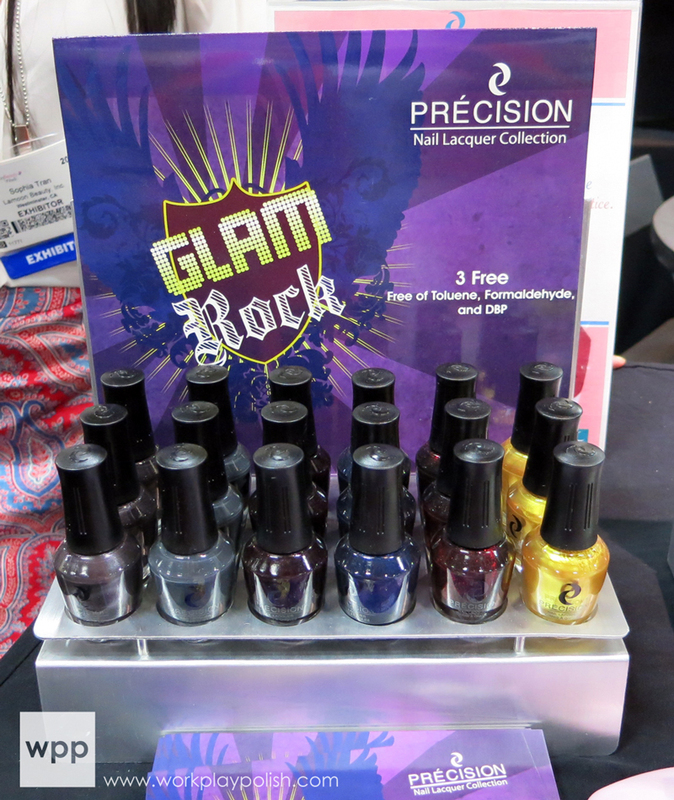 I learned about Precision Nail Lacquers during a visit to their booth at Cosmoprof North America. This polish line was created by family-owned Lamoon Beauty specifically with nail technicians in mind. The line includes 80 core shades, as well as nail art tools and treatments. Today I've got pics of a few recent collections and swatches of their Summer 2013 release, Color FX. There's a lot to cover! 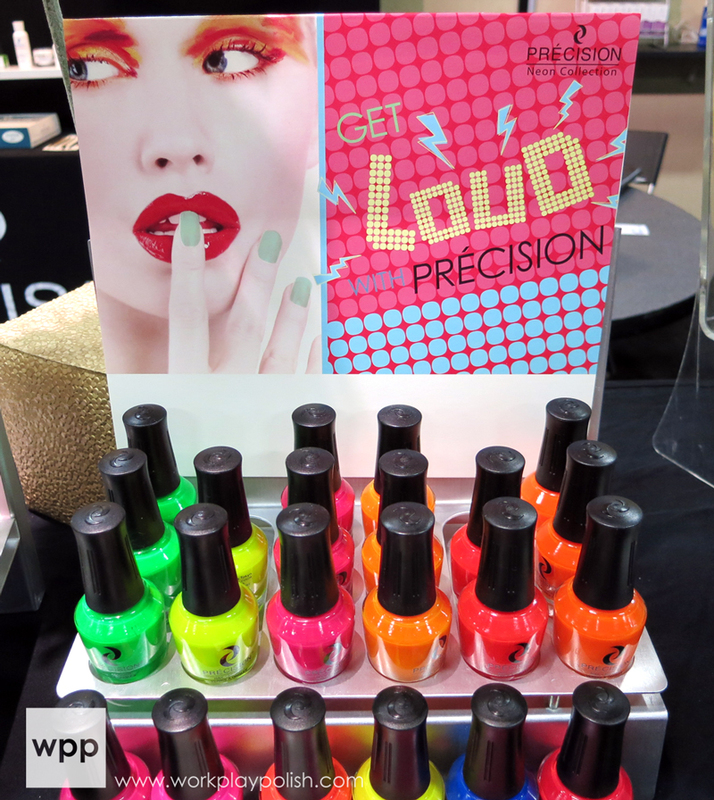 In addition to the 80 core shades, Precision Nail Lacquers has released several seasonal collections. All of the collections I'm showing you today are still available on their website. The Dreamy Collection consists of six creamy pastels: (L to R) Blissful Abyss, Enlightenment, Walking on Air, Grape-Divine, On Cloud 9 and McDreamy. The Get Loud Collection includes 12 ultra brights and neon shades: (L to R) bottom row: Razzmatazz, Vio-Let Me Rock, Electro Daisy, I'm Berry Shocked and Girls Just Wanna Have Fun. top row: Lime a Dozen, Got an Idea?, My Little Peony, Kiss Kiss Tan Tang, Pink-adelic and Orange she Hot? The Oasis Collection contains three nudes and three dark colors that are perfect for Fall: (L to R) Sahara Deserted Me, You're in De-Nile River, Sage, Been There Done That, Sandstorm and Scorpion King. Nail Polish Wars has nice swatches of this collection here. The Toxic Love Collection has deeper winter hues in creme and shimmery metallic finishes: (L to R) I'd Love to Hate You, Poison Ivy, Intoxicated, I'm Addicted to you..., Toxic Wast-ing My Time and Till Death Do Us Part. The Glam Rock Collection has six vixen colors, including an amazing metallic gold (you have to see this one in person): (L to R) Glam Metal, U Rock & Roll, VIP - Very Important Polish, Rebel Red in You and Party Like a Rockstar. I actually got to test drive the polish. The Color FX Collection is their Summer 2013 release. The shades are summery and fruity. I was impressed with the formula and application. All six polishes had a thinner consistency, but were easy-to-control. The brush bristles are longer than I'm used to, but I got the hang of it quickly. The shades in this particular collection aren't super unique, but they're great quality summer staples. All swatches are topped with one coat of Glisten & Glow HK Girl topcoat. Wait a Melon for Me is a soft cantaloupe orange with a smooth jelly finish. My swatch is two coats. There's still a very faint visible nail line, which I didn't mind. It would be completely opaque in three coats for sure. The Next "It" Girl is a warm, sunny yellow creme...practically a dead-on dupe for OPI The "It" Color. Application was excellent for a yellow. My swatch is three coats. Honey Dew This is a light fern green. This is similar in color to OPI Green-wich Village, but the formula is very different. Honey Dew This has a sheer crelly finish. The formula was nice. I used three coats. Pur-fect FX is a pretty medium purple creme. And finally, we have my favorite, Surfin' in Maliblue. It's a clean lake blue. This is two easy coats. All Precision Nail Lacquers are three free and cruelty free. 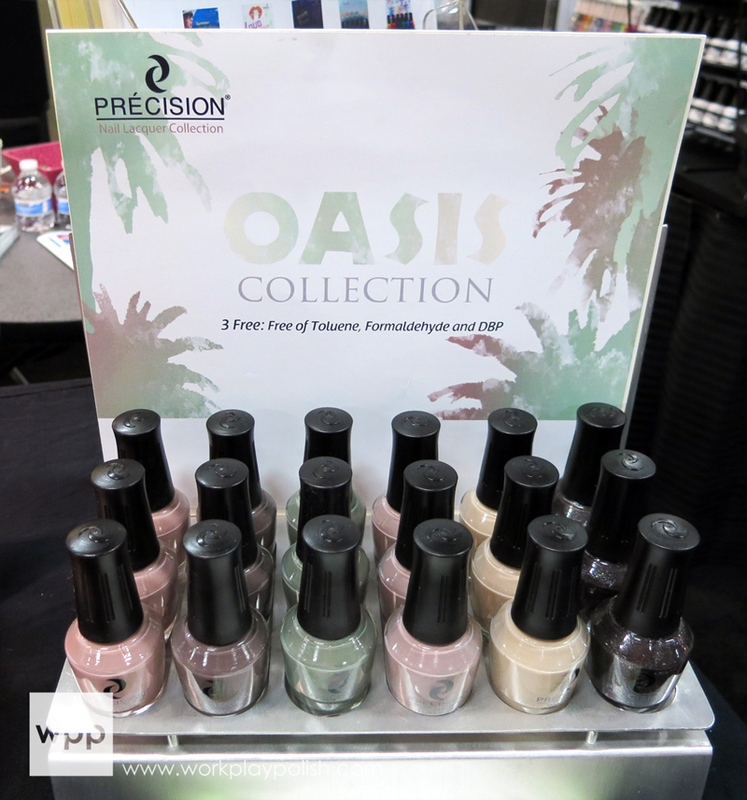 The large, custom designed 16ml bottles are available to professionals through beauty supply stores and directly to consumers from the Precision Nail Lacquer website for only $5.95, an excellent price point for a professional line of polish. Find out about new products and promotions through their facebook and twitter.